Vlog #111: Starting Dust Collection Prep. Last Thursday – Crafted Workshop Shop Tour. Last Saturday – Interesting Stuff From Around The Web. Last Sunday – Interview video featuring Wayne Brown. This Thursday will hopefully be a video on my heating and cooling setup in the shop. This Friday will hopefully be another episode of The Woodworking Podcast. This Saturday will be another Around The Web post. This Sunday will hopefully be a video on making customized, custom chisel handles. Update on my dog: She’s doing a lot better. No surgery needed immediately. She has a collapsing trachea. We have her on meds to manage the situation. 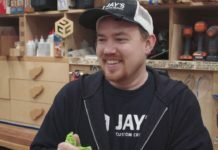 Sorry to hear about your dog Jay, hopefully it isn’t anything serious. Are you planning to use the same blast gates you built a while back with this new system? Speaking of dust collection SYSTEMS,,, Why doesn’t Oneida or Rockler or SOMEBODY make a complete piping system that uses fittings that ACTUALLY FIT with the standard 4″ sewer pipe!? Anyway, I just returned all the Powertec fittings to Amazon (they don’t fit) and the sewer pipe to Home Depot (they don’t even MAKE fittings for that), and reordered schedule 40 pipe and fitting for that. Now,,, where does it all go….? First of all, hope your dog gets better quickly and no lasting problems. Second, wow Johnnies workshop!…one awesome place to work….though I still feel he needs more tools LOL. We have pretty basic taxes, evens so, my sister works for a major tax prep company so we get our taxes done for free. I hope your dog feels better and that the bill isn’t too steep. Great news of your dog, hope she has a quick recovery.. give her a pat on the head from me ???? Prayers for your puppy! And good hopes for your taxes! I noticed that you have replaced the modified HF Dust Collector with something else. Problems with the HF Unit or what. I am in the process of building your unit with the addition of a selectable Wynn filter or window exhaust when not using climate control in my shop. I hope you are wearing good dust protection while you work under the porch and around the septic tank. Sometimes there are very toxic fungi, etc. in those areas. 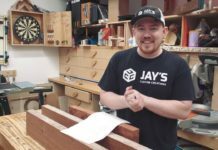 Lost a good woodworker friend due to bad dust fungi. Best wishes for the nice dog. You are taking good care of her. So glad to hear that your dog is doing better! Also glad to hear that the doctors have given you the green light to allow those creative urges to be unleashed! Keep up the awesome work! Also love the weekly podcast!